Blessings and greetings in the name of our One Lord Jesus Christ. I’m glad to be with you today and grateful that you are a hearty group of United Methodists who gather from around New England because you believe change is possible, in our lives, in our Church and in our country. That’s a very good place to start. I serve as the executive director of the Massachusetts Council of Churches, a network of 17 different Orthodox and Protestant denominations, including the New England Conference of the United Methodist Church. Through our history, the churches together have witnessed to a more just and sustainable society through the MCC. We strive to speak together because of we are one in the Body of Christ. But I’ll confess, we didn’t really engage with the Occupy Boston movement this fall. I was new at the MCC, having just become the executive director in November. Occupy was confusing. It was chaotic, unwieldy. Was it about tents, what is about corporate greed? Was it about making urban poverty visible again or was it about reclaiming public space? There wasn’t one person to call. There wasn’t one leader to meet with. There wasn’t one document to sign on to. For churches and Christian institutions that are used to making decisions and setting direction with documents, it was unclear how to be in relationship with Occupy. Let’s name the reality of this complexity. I remember speaking with a pastor friend in October, who said “I want to go visit Dewey Square, but it’s complicated. Some of my people are pitching their tents. Some of my parishioners work in the Financial District. How do I love and care for them both, and witness to the kind of economic justice God wants for all the people?” I sent blankets with friends, but I never went to Dewey Square. I wish that were different, but I am also not convinced that there is only one way to support social change. So I don’t speak to you today as a practitioner who stayed in the tents, but I speak to you as one who loves the Church, believes in the witness of Christian reconciliation to a broken world, and an observer of this moment. But I think the theological reflection we can do here can help the Church be more of the unified, faithful, hopeful voice for economic justice that our Lord and Savior calls us to be. Now is the time after the encampments of Occupy. The embodied expression of the hope of Occupy is gone from the public space of Dewey Square. The statue of Gandhi has gone back to the religious community from which he came. Which at a practical level means you can’t take a youth group down for a visit, can’t bring warm soup, can’t celebrate Wednesday night communion (incidentally, you can go pray on Friday mornings with a group to Occupy Lent). Like the disciples after Jesus’s ascension, we are left with the memory of the experience, the words and the images, but without the embodied thing to hold on to. The hope of Occupy has this second generation problem- how do you communicate something deep and powerful and evocative and fleeting once the moment is gone? How many of you spent time at one of the Occupy encampments? In a way, to make “the Hope of the Occupy Movement a Reality” as you stated in the program for today, we are going to need more people than the numbers that participated in the physical occupation. Let me ask again, how many of you had a group from your church, more than just you, visit Dewey Square? Repeatedly I’ve heard that “Occupy is a moment,” from a number of trusted friends in the Protest Chaplains, a multi-denominational group of Christians that sustained a pastoral presence at Occupy Wall Street, Boston and other locations. She said “Occupy not an entity, but a moment. It is a change of consciousness, an arising. It is a moment of hopefulness. And my warning to the church is that we could miss this moment.” We now find ourselves in that moment of the second generation. Christians who enter the stream after Jesus is risen or third generation Israelites, who live in the aftermath of Moses and Joshua, but “did not know the Lord nor the work which He had done for Israel” (Judges 2:10). Perhaps, we didn’t have the experience ourselves, but God still calls us to greater faithfulness. Take this as one perspective- not definitive or final, but my own strategic thinking about change and the Church. We need activists and disciples at all points of engagement. We need people far out ahead of the people wandering in the desert who can help us imagine what the promised land looks like. We need radicals and saints and activists and advocates. We need the brave Christians from Occupy who put their bodies on the line. We need the churches who took people in. We need the thinkers and poets who gave us the new language about economic injustice so that everyone is talking about the 99% and the 1%. But for change in the Church, I am convinced that the quest for economic justice that looks like God’s shalom will not take deep root in the Church unless and until faithful stewardship of money is part and parcel of what it means to be a faithful Christian. A holy and healthy relationship to money must become inherent in what it means to follow Christ. Sure, they will know we are Christians by our love, but will they know we are Christians by how we consume? I think there are parallels here to the environmental movement. Care of Creation will not take deep root in the Church unless and until faithful use of Creation is part and parcel of what means to be a committed follower of Christ. Until then, it’s simply too easy to be dismissed as one possible issue to pick among many. A Quaker colleague of mine taught me a phrase from their community for someone with a pet project, “a Friend with an Issue.” And that’s the danger right? You’re someone who gets labeled as the economic justice guy or the environmental lady or the mission project team- and it’s easily dismissed. This mainstreaming of economic discipleship into faithful following of Jesus Christ is not impossible. We have the resources within our tradition to do it. For me, the experience wasn’t Occupy, but a small group Bible Study called Lazarus at the Gate. The Boston Faith and Justice Network, an ecumenical group of younger evangelicals and mainliners in Greater Boston has created this curriculum on our relationship with money and global inequality. So for twelve weeks, I sat down with 4 other members of my church and talked about my finances, how I purchased things, what Scripture said about economics and studied the current reality of global poverty and the systems I participate in that keep that oppression in place. This is the group where the retirees asked if it was a faithful thing to do to have long-term care insurance. This is the group that helped me look at my lifestyle and my aspirations. They said “you don’t need to own a car” and helped me to give it up. This is the group that pooled the money we saved, and gave to poverty alleviating ministries. We aimed to spend joyfully, spend justly, consume less and give more. This happened at Hope Central UCC/DOC, at Cambridge Vineyard Fellowship, at Park Street Church. It is possible, in small and profound ways, to offer people an experience of confronting the reality of global poverty and the Scriptures with the support and encouragement to make personal change. I am convinced that we need to give people a chance to experience: to grieve how the system distorts their own lives, to hear the struggles of others, to remember the eschatological vision of economic justice and to try and experience a taste of that in our own lives. We don’t have the encampments anymore, but in order for the Church to seize this moment of transformation, we need to offer people experiences. Use Lazarus at the Gate, use something else, but find a way to give these second and third generations of Christians a personal experience of the brokenness of our economic system and a hopeful glimpse of the economic justice God intends. I want to take a step back from my particular experience and note 8 lessons I think the Church can learn from Occupy. 1. Incarnation: I think that part of the reason that Occupy was so powerful for so many people is that it required face-to-face, human interaction, across class and race. The ask was big: Show up. March. Sleep outside. Feed the hungry, clothe the naked. Talk to one another. Not sign a petition, click a link, write a letter- all of which are fine ways to support an action, but rarely ways to become committed. Occupy is a powerful reminder to the Church that we are most like the Body of Christ when we are actually embodied to one another. Moreover, when we are physically present to one another, it’s much, much harder to ignore the injustices that keep you poor and me rich. Occupy is a reminder to shorten the distance between one another by actually using the bodies God gave us to get near. Think even of how support was expressed- with twinkle fingers, a silly, joyful, embodied movement of support. Occupy was built not on consent on a common belief statement, but on a shared, embodied experience. The post-modern, post-denomination Church would do well to take note of this. 2. Power of Icons: As one of the Protest Chaplains said to me “Occupy insisted on images. If there was no photo, it didn’t happen.” Think of the images- the marching, the raids, the police brutality, the pepper spray, the row upon row of tents, the photos passed around online with people declaring “I am the 99%.” In a digital age, images are part of what tells an evocative story about our economic system. The Church desperately needs to invite artists and designers to use their gifts and skills to help us again envision the peaceable kingdom that God wants for all people. 3. Testimonial– One of the lessons of Occupy is that we need to invite people to tell their personal stories of interacting with an unjust economic system. To see our own experience, distortion, complicity and want to change for ourselves and for others- that’s what allows a move from charity to solidarity. This practice of testimonial is indigenous to the Church. But it is a skill and something we can practice as a spiritual discipline. I also heard from the Protest Chaplains that Occupy gave them a good reminder to not be embarrassed by their Christian language. Many people who gravitated to Occupy have been wounded by the Church. For the chaplains, Occupy gave them space to speak about their faith in ways that were hopeful and not confrontational. This necessity of storytelling in a new space is part of the reason the Mass. Council of Churches annual meeting on 4/28 is about Christian Unity in a Digital Age. We recognize that most congregations and judicatories are not occupying the internet with sufficient skill and commitment to have our story be heard there. If we are not a part of the conversations online, others will be and we concede the space. We’ll have Marissa Egerstrom of the Protest Chaplains on hand to lead a workshop on social media and social change. 4. Public Space: Occupy insisted on being present in public space. They shortened the protective distance between themselves and Creation. By being present in an unexpected public space, they forced others to view an injustice that is much easier pushed behind the walls of foreclosed houses, homeless shelters and corporate boardrooms. To get the message of protest and change through, they took up public space. I became a Christian in an evangelicalish UCC church where the youth group dressed in bible costumes and carried a 12 foot wooden cross through the streets on Good Friday. More often than not, Church now happens behind closed doors. Occupy brought private concerns about whether or not a person could repay their student loans and brought it to the physical public space of Dewey Square or the virtual public space of social media. 5. Authority : this is big and it’s tricky. One of operating principles of Occupy was the leaderslessness and a messy commitment to give everyone a voice. Occupy aimed to listen to every voice, fed by logistics of social media. One way of putting this is that Occupy lead with a priesthood of all believers. All were ministers of the Occupy movement, all possible to make change. At Occupy, there was no instant authority. This is a hard reminder to the Church because we often come in with a sense of entitled authority. We should be listened to because we’re the pastor, we should be paid attention to because we are the Church. Occupy didn’t presume authority, you earned it by being physically present and embodied to the struggle of others. In working with the ecumenical movement, there’s an older generation of deeply faithful Christians who grieve a sense of lost status of the Church. I admit this is harder for me to understand because I never knew the Church in this privileged position. One of the Protest Chaplains told me a story of a big steeple pastor, a seminary professor who agreed to come preach a Wednesday Occupy worship service. When he got there, he folded up his sermon, stepped down from the lectern and pulled up a chair, “Tell me about your experience” he said. Rather than preaching to the people, he came to listen- and in doing so, gained the authority that every other person there had simply by being a child of God. 6. Control of the Narrative: Occupy took an abstract and inaccessible political situation about bank bailouts and campaign finance, and created a framework where they could control the message: they spoke of the 99% and the 1%. It’s clear, concise, inclusive and evocativeThese are the phrases we all use to talk about economic disparity in our world. In the months following Occupy, media mentions of “income inequality” increased by 500%. . I’ve come to believe that Christians need to take up the spiritual disciple of using Twitter because it forces us to be concise in 140 characters or less. Instead of complaining that television hosts only talk to “those Christians,” (which is real and frustrating) the Church can learn from Occupy the power of finding a positive frame, sticking with it and controlling the narrative. 7. Living with Chaos and Conflict: Without a doubt, Occupy isn’t a perfect movement. It’s made up of broken humans in a broken system. But Occupy did learn to exist with chaos and conflict. I look at the General Assembly, a hallmark decision-making process for Occupy, and the Congregationalist in me thinks “Congregational Meeting.” This is a time of enormous change for the Church in the United States. We can choose to or we will be forced to learn to live with chaos and uncertainty, perhaps even as much uncertainty as if we will be evicted from our church the next day. Here’s my hunch. Everything for me rises or falls on this bet. I’m putting all my eggs in this basket: The turnaround of the mainline churches will happen when we in those churches care as much about those outside the church, as we do those inside. To embrace relevance, we will have to let go of survival. That’s it. That’s all I’ve got. If I’m wrong, fire me now. I’ll die on this hill. Occupy attended to the outside, not just the inside. What would church look like if we did the same? Global Church– As the one body of Jesus Christ spread throughout the world, at our best we have a built in sense of solidarity with Christians in other lands. Earlier this spring, the Greek Orthodox Archdiocese of America took up a call through their women’s charity Philopotocos to provide money to churches in Greece who were folding under the debt crisis. We offer Occupy the reminder that even with hardship in our country, we are the 1% globally. Our mission partnerships, our sister churches, our sense of God’s provision for the whole inhabited earth are resources we can offer the global Occupy movement. Ritual– Without a doubt, Occupy built their own rituals- an embodied sense of consent or disapproval, a regular practice of meeting, a communication and educational practice of “Mic-Check.” The Church offers Occupy the weekly ritual practice of giving over our finances in community life, joyfully, hopefully acknowledging that our money is not our own but from God. Here’s the problem that I see when I visit churches- too many churches simply say “ the morning offering will now be received,” if they say anything at all. This is a huge missed opportunity to teach and testify. And it’s insider baseball that never lands if you are a newcomer to Church. Explain why we give, why its sacred, why you personally do it, why all our lives, our resources, our money ultimately come from God. We have an opportunity to form our communities each week in relation to money, we shouldn’t squander it. Let me conclude by saying this: The Church could miss this moment. Occupy has given us new language, a cultural awareness of a great problem and a fertile ground to do work within our own communities. We could ignore it and miss the moment. It would be an embarrassment to us to pretend like Jesus has nothing to say about economic injustice. And it would render the Church further removed from the pain and brokenness of the world that we are called to serve. Without a doubt, biblical economics call for a serious interrogation of our current economic system. The Church can be a part of this, or we can stay within our walls. We have an opportunity to be present to our people and witness to another way of being. Guilt is a theologically thin motivating factor. Offer an experience of the hopeful, scriptural vision of abundance in Christ. Another word for Occupy, is incarnate, dwell, inhabit. 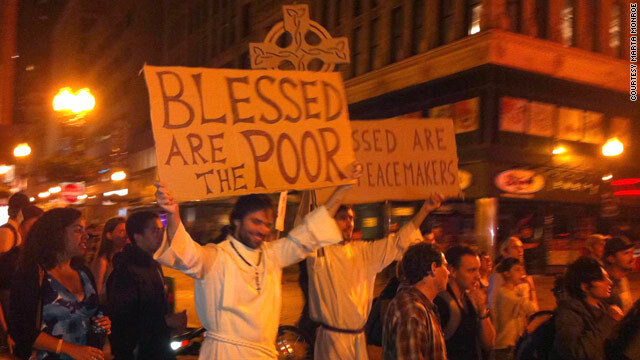 Occupy is all about incarnation and shortening the distance between one another’s suffering. Is that not the witness of Christ? In the opening hymn of John 1, Christ the Logos came and “dwelt,” he pitched his tent, sojourn among us. Like the temporary structure of Occupy. We’ve had our experience of incarnation. Now we have to get to the hard, steady task of making disciples. Notes from phone call with Rev. Kate Layzer, UCC pastor 3/9/12- with gratitude! Thank you for dwelling with us, Rev. Laura.